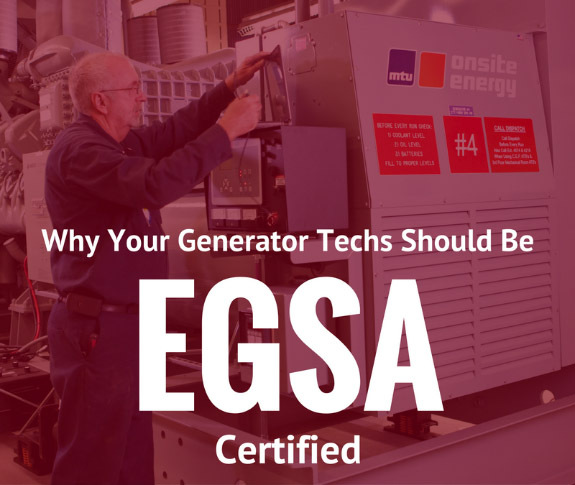 Skill, training, and expertise are just a few marks of a seasoned generator technician, but there is one sign of a truly distinguished generator tech and that is an EGSA certification. Receiving a certification from the Electrical Generating Systems Association (EGSA) is one of the most significant milestones for a Pacific Power Group journeyman-level generator technician. This certification ensures that technicians are highly trained in prime movers, controls, automatic transfer switches, voltage regulators and a variety of other generator components across major generator brands including MTU Onsite Energy, Generac, Kohler, Cummins and CAT. The certification is a testament to the level of personal achievement of each of our technicians and demonstrates their commitment to continuous innovation and self-improvement. As generator technologies evolve, so do EGSA certification standards. These certification updates reflect the most relevant and applicable technologies and generator maintenance practices. PPG journeyman-level technicians also undergo annual training on generating system updates and new technology, ensuring that their knowledge of generator protocol and equipment is cutting edge and above industry standards. With certified experts in installation, service, maintenance and repair on your side, your power generation system will run more smoothly and you can trust that PPG gets the job done right. Interested in learning more about projects that our EGSA certified power generation team has worked on? Click here to learn more about our Power Generations team’s work at the critical Clear Air Force Station in Alaska.